Retailers need a 'Unique Selling Point' that secures the future and can focus a better service to their customers. The ABUS Plus key system is like no other key and provides exceptional security levels via its 250,000 genuine differs. It can be a Hardware retailer's USP. It can only be cut on a special ABUS machine, keeping out the competition, whilst giving consumers the very best security. For a limited period this ABUS Plus-Key cutting machine is available via HOPPE and Toolbank on an unbeatable deal. 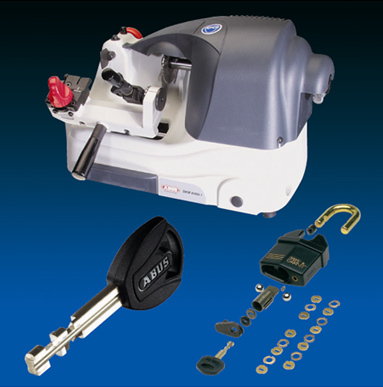 When added to any ABUS £500 stock order, the RRP £2,500 Plus-Key cutting machine can be bought for only £500 net. And it comes with a free key decoder worth £119 and 100 Plus key blanks, worth over £500 when cut. So when the first 100 free Plus key blanks are cut, the new machine will have paid for itself. After that, every key blank cut will deliver at least £3.60 profit to the retailer. These Plus keys are used in the premium ABUS Granit, Diskus and 88 padlock ranges which are visually imposing very robust, and resist most attacks. The Plus locking mechanism adds to their security appeal by making them manually un-pickable, while key reproduction is limited to specialist retailers with the ABUS Plus USP.